News of Amazon’s impending arrival to Singapore leaked yesterday, which stirred a buzz of excitement among Singaporeans. And true enough, Amazon Prime officially launched today in Singapore. (We had a first look at its fulfilment centre housed at Mapletree Logistics Hub earlier – we’ll share photos of it soon!). Its website is already up and running now (previously, the URL keeps getting redirected to a Status 500 page); and its app was also released on the App Store yesterday night. The app is also trending now by the way. Amazon’s Prime Now service will be competing head-on with grocery startups Redmart and Honestbee, and could very well steal market share away from local supermarkets like NTUC Fairprice, Cold Storage, Giant, and Sheng Siong. It’s also battling Lazada’s LiveUp, which aims to secure the loyalty of their users through a membership system. With the entry of a new player in town, it begs the question: who is the best among all? 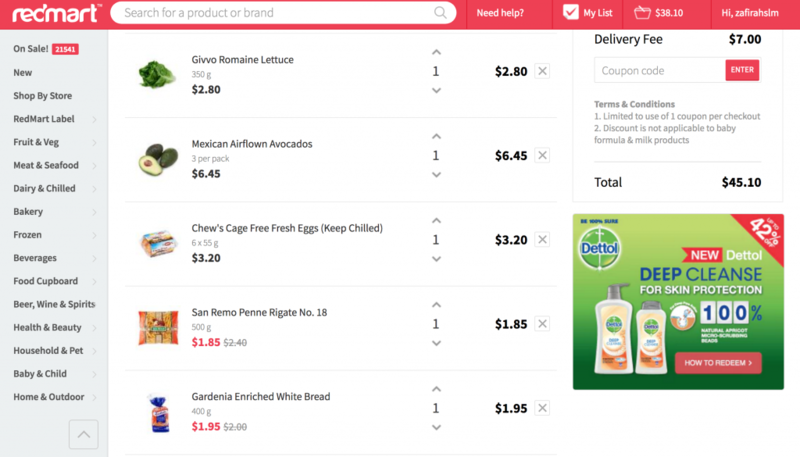 We decided to do a quick comparison among Amazon’s Prime Now, Redmart, and Honestbee to see which service provider outranks the rest in terms of speed, price, and product variety. First of all, a thing to note: This service is currently only available on mobile and is not (yet) available on the web. I would typically minus off points for this since I reckon it would be a bit of a pinch to browse on a smaller screen size, but the app’s user interface is actually very well-designed. 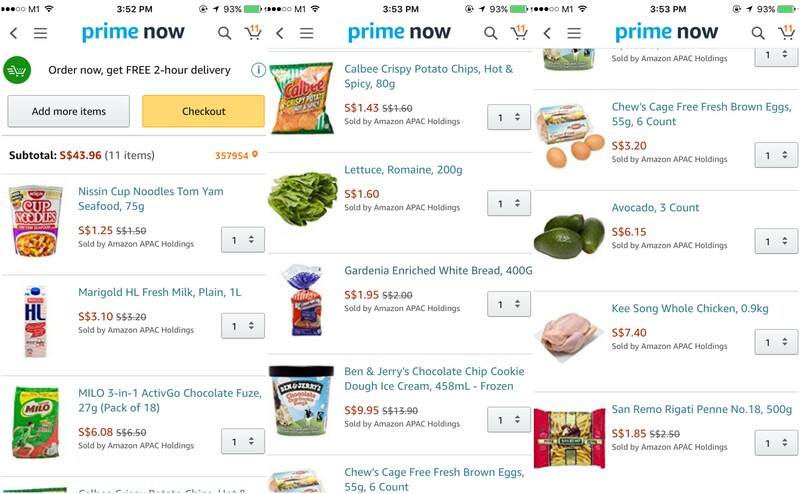 Amazon Prime Now offers tens of thousands of daily essentials, and the products are clearly shelved under the different categories. For food alone, there are 13 categories to choose from, which makes browsing a breeze. With over $40 spend, this qualifies us for a free two-hour delivery. Orders below $40 will be charged an additional $5.99 delivery fee. ** Please note that for an initial period of time, customers would be able to try the Prime Now service without a Prime membership. It is still unclear how much this membership would cost once it rolls out. RedMart claims to have a selection of 70,000 products, but it was honestly a tad disappointing to see ‘sold out’ items in their listing. ** Note: Some items are heavier/larger than Amazon’s – ie. whole chicken, Romaine lettuce. If you are a first-time customer (I’m not), you can enjoy a free delivery for orders above $30. However, if you are a returning customer, free delivery is only applicable to orders above $49. Otherwise, you’ll be charged a flat fee of $7. … Which adds up a grand total of $52.80! One particular saving grace of RedMart is that it actually adopts a bundle pricing system, so the more products you buy, the cheaper it’ll be. That said, I would recommend RedMart if you are going for a bulk purchase instead of ordering a few items (as per our list). 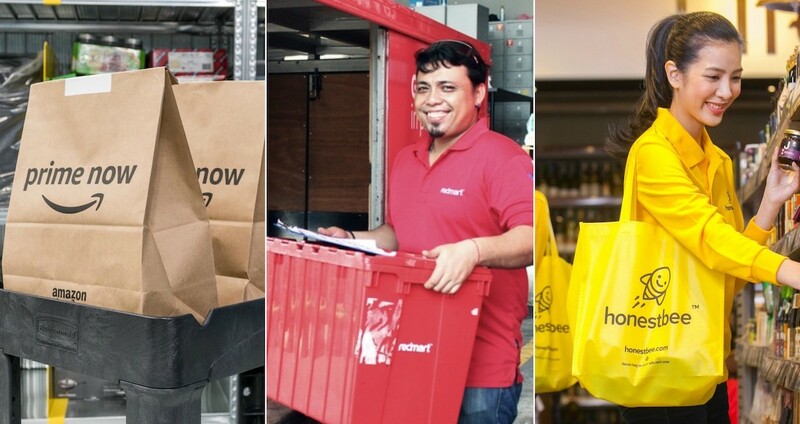 RedMart delivers everyday, including weekends and public holidays, from 10 am to 10pm. An additional charge of $1 to $3 will be imposed for deliveries till Saturday noon (order is placed on Thursday afternoon). Otherwise, the earliest delivery slot without any additional fees will be on Saturday 12pm to 2pm. 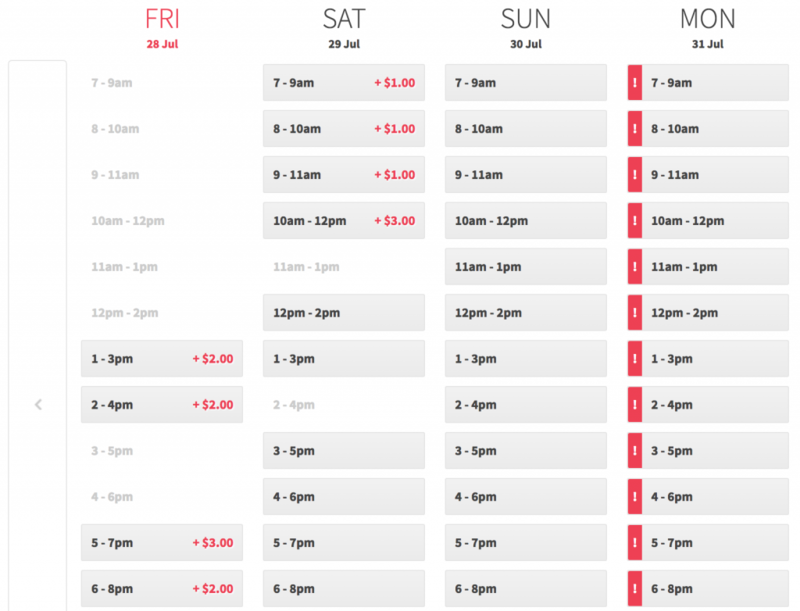 This means that a free RedMart delivery will take as early as 2 days. (As opposed to Amazon Prime’s 2-hour delivery, ehem). Honestbee offers delivery services across different stores. Currently, you can shop from 37 brands – from specialty stores, supermarkets, and farm-to-table marketplaces. Avocadoes are unfortunately not available. BUT, here’s something we discovered – the availability of the items depends on the delivery address. So when we input a different postal code, avocadoes were magically available again. What. The minimum order for free delivery is the highest for Honestbee. Particularly for NTUC FairPrice, the minimum spend is $50, otherwise a $10 delivery fee is applicable. …This brings the total fee to a whopping $56. To make it worth the while, it’s best to hit a minimum order of $50 because a $10 delivery fee is very expensive. Their delivery timings aren’t shabby either – the earliest delivery is next day before noon. Because Singaporeans love a good bargain, I bet that price is the most important factor among the three. Even without factoring in the additional delivery fee, Amazon still has the cheapest total. Besides this, it also offers the lowest minimum order at only $40 to qualify for a free (same-day) delivery. Even if we don’t hit the minimum purchase order, it’s not much of a pinch as Amazon also offers the lowest delivery fee at only $5.99. And what makes shopping even sweeter on Amazon right now is that they are offering a promo code to celebrate its debut in Singapore! 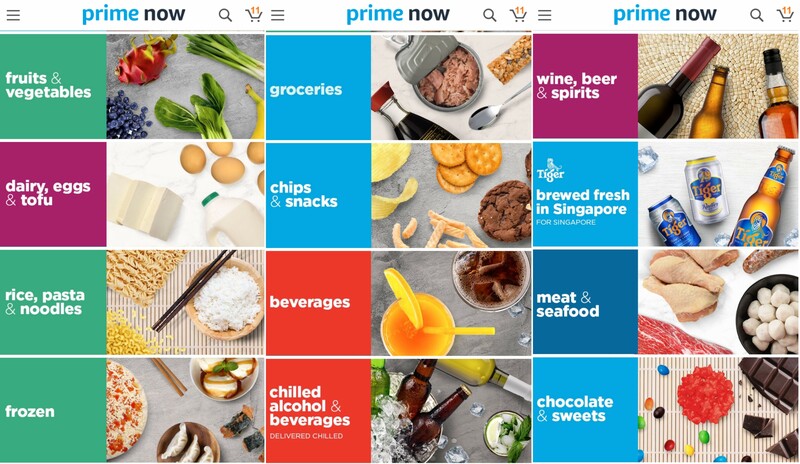 Customers who shop using their Visa credit card will receive S$20 off their first Prime Now order using promotional code ‘VISA20′ for a limited time. 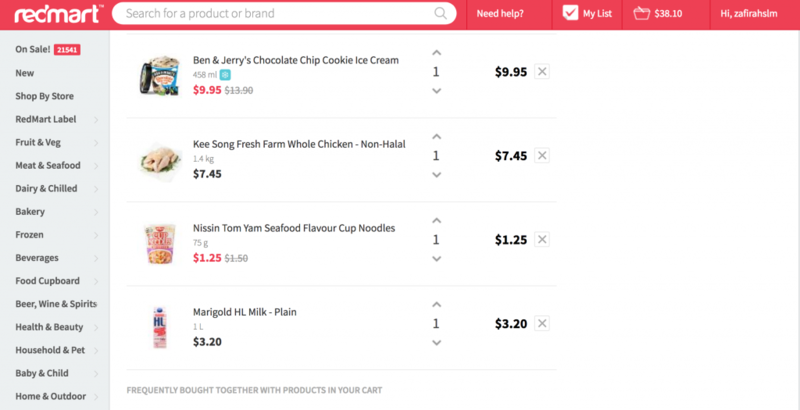 Customers without a Visa card can get S$10 off their first order instead using promotional code ‘10PRIMENOW‘.